Consumers in Canada are gaining a new option to recycle their plastic bags and films through an expanded program being launched by that country’s largest retailer.Wal-Mart Stores Inc. is joining with S.C. Johnson & Son Inc. and the Canadian Plastics Industry Association to promote a consumer-facing recycling program aimed at not only used shopping bags, but also other types of plastic bags and films. 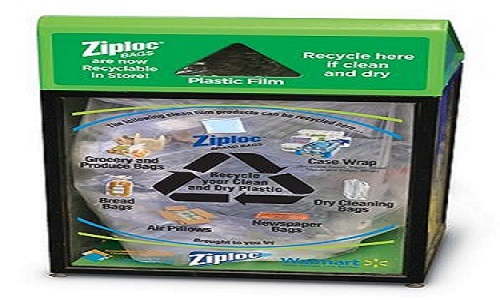 Wal-Mart already had been featuring collection containers for shopping bags at its Canadian stores, but now is expanding the types of plastics that will be accepted through these containers, said Krista Friesen, vice president of sustainability for CPIA. S.C. Johnson is involved in the program, which is now in a “soft launch,” because it makes the well-known Ziploc brand of plastic bags, she said. CPIA, along with facilitating coordination of the expanded effort, will be conducting audits of the recycling stream in the coming months to get a handle on what types of plastics are being diverted to the containers. The association also will provide support on the store level as the expanded program launches. While previous incarnations of the collection containers have stressed the ability to recycle shopping bags, new language and illustrations on the containers will alert consumers about the wide variety of plastic bags and films that can now go in the units. Bread bags. Yes. Dry cleaning bags. Absolutely. Newspaper bags. Indeed. Grocery and produce bags. Yes, again. Case wrap. You betcha. 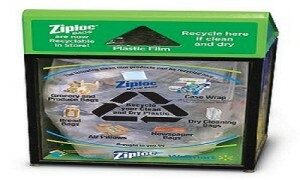 And, of course, Ziplock brand bags as well as any other food storage bags are accepted. A key to the program, however, is that the material being recycled needs to be clean and dry. “If it’s collected and it’s clean, recyclers want it. From our perspective, we want to increase the accessibility that our Canadian population has to recycling the material,” Friesen said. “And we want, as much as we can, to provide higher volumes of clean material back to the recycling network. Our position is its high-value, and the public wants to do the right thing with this material,” she said. “We just want to provide the infrastructure that provides that for them.” Plans to expand the bag and film recycling program began about two years ago, Friesen said. That’s important because not all municipalities offer such service.